[p.23] Joseph Smith, Jr., with his wife Emma were living in Harmony, Pennsylvania, in the summer of 1828. The writing of the early portion of the book of Lehi occupied about two months before Smith allowed Martin Harris, an early scribe and benefactor, to take the manuscript to show it to family members. It is not clear if Lucy Harris, Martin’s wife, destroyed the manuscript or gave it to others. The result was that the pages were lost and Smith asked God how this could be. He was told that Harris and he transgressed. A couple of other persons helped take dictation from Smith until a new scribe, Oliver Cowdery, assisted Smith and the work progressed rapidly from then on. They were instructed not to rewrite the lost manuscript pages. Revelations were given to Cowdery and other new acquaint- ances impressing upon them the marvelous work to come forth. In June 1829 Smith went to the home of Peter Whitmer, Sr., in Fayette, New York, to finished the Book of Mormon. The revelations he received are considered inspired instructions relating to the forthcoming Book of Mormon and to early followers of Smith. Once the Book of Mormon was completed, Harris mortgaged his farm to pay for the book. The idea of a church organization was considered during this period. [p.24] The works, and the designs, and the purposes of God, can not be frustrated, neither can they come to nought, for God doth not walk in crooked paths; neither doth he turn to the right hand nor to the left; neither doth he vary from that which he hath said: Therefore his paths are strait and his course is one eternal round. Remember, remember, that it is not the work of God that is frustrated, but the work of men: for although a man may have many revelations, and have power to do many mighty works, yet, if he boasts in his own strength, and sets at nought the counsels of God, and follows after the dictates of his own will, and carnal desires, he must fall and incur the vengeance of a just God upon him. Behold, you have been intrusted with these things, but how strict were your commandments; and remember, also, the promises which were made to you, if you did not transgress them; and behold, how oft you have transgressed the commandments and the laws of God, and have gone on in the persuasions of men: for behold, you should not have feared man more than God, although men set at nought the counsels of God, and despise his words, yet you should have been faithful and he would have extended his arm, and supported you against all the fiery darts of the adversary; and he would have been with you in every time of trouble. Behold thou art Joseph, and thou wast chosen to do the work of the Lord, but because of transgression, if thou art not aware thou wilt fall, but remember God is merciful: Therefore, repent of that which thou hast done, and he will only cause thee to be afflicted for a season, and thou art still chosen, and wilt again be called to the work; and except thou do this, thou shalt be delivered up and become as other men, and have no more gift. And when thou deliveredst up that which God had given thee sight and power to translate, thou deliveredst up that which was sacred, into the hands of a wicked man,2 who has set at nought the counsels of God, and has broken the most sacred promises, which were made before God, and has depended upon his own judgment, and boasted in his own wisdom, and this is the reason that thou hast lost thy privileges for a season, for thou hast suffered the counsel of thy director to be trampled upon from the beginning. Nevertheless, my work shall go forth and accomplish my purposes, for as the knowledge of a Savior has come into the world, even so shall the knowledge of my people, the Nephites, and the Jacobites, and the Josephites, and the Zoramites, come to the knowledge of the Lamanites, and the Lemuelites and the Ishmaelites,3 which dwindled in unbelief, because of the iniquities of their fathers, who have been suffered to destroy their brethren, because of their iniquities, and their abominations: and for this very purpose are these plates preserved which contain these records, that the promises of the Lord might be fulfilled, which he made to his people; and that the Lamanites might come to the knowledge of their fathers, [p.25] and that they might know the promises of the Lord, and that they may believe the gospel and rely upon the merits of Jesus Christ, and be glorified through faith in his name; and that through their repentance they might be saved: Amen. in [1-28] February 1829 for Joseph Smith, Sr. Remember temperance, patience, humility, diligence, &c., ask and ye shall receive, knock and it shall be opened unto you: Amen. [p.26] Remember faith, virtue, knowledge, temperance, patience, brotherly kindness, godliness, charity, humility, diligence. – Ask and ye shall receive, knock and it shall be opened unto you. Amen. BC 3 is a revelation dated February 1829, for Joseph Smith, Sr. Verse 2 reads: “Remember temperance, patience, humility, diligence, &c., ask and ye shall receive, knock and it shall be opened unto you: Amen.” The 1835 D&C added other virtuous personality traits. The words added are: “faith, virtue, knowledge” and “brotherly kindness, godliness, charity” (see 2 Pet. 1:5-7). At the same time the symbol “&c” was not in the 1835 D&C. While this is perhaps a small and seemingly insignificant change, it is not supported by either the BC or a manuscript in the handwriting of Edward Partridge located in LDS archives. The manuscript has a small lacuna where a brief background to the revelation was given. The altered portion of the text is not in the area effected by the hole and can be clearly read. It is reasonably certain that the additional words would not have been in the revelation of February 1829. Therefore the earliest text and shortest text all favor the BC reading. and now behold, this shall you say unto him, He who spake unto you said unto you, I the Lord am God, and have given these things unto you, my servant Joseph Smith, jr. and have commanded you that you shall stand as a witness of these things, and I have caused you that you should enter into a covenant with me that you should not show them except to those persons to whom I commanded you; and you have no power over them except I grant it unto you. And you have a gift to translate the plates; and this is the first gift that I bestowed upon you, and I have commanded that you should pretend to no other gift until my purpose is fulfilled in this; for I will grant unto you no other gift until it is finished. Verily I say unto you, that wo shall come unto the inhabitants of the earth if they will not hearken unto my words: for hereafter you shall be ordained and go forth and deliver my words unto the children of men. Behold if they will not believe my words, they would not believe you, my servant Joseph, if it were possible that you could show them all these things which I have committed unto you. for a desolating scourge shall go forth among the inhabitants of the earth, and shall continue to be poured out, from time to time, if they repent not, until the earth is empty, and the inhabitants thereof are consumed away, and utterly destroyed by the brightness of my coming. To summarize, Joseph Smith was commanded to translate the book or plates, which would be his only work, as, indeed, the project consumed most of his time for the next several months. The revelation indicated that Smith should pretend to no other gift/work, as he would not receive another. The change in the March 1829 revelation appears to have been made to eliminate problems with Smith’s later involvement with the Bible revision. Since the Bible revision was still in manuscript form in 1835, three of the additions made sure that no work would be excluded from Smith. The textual additions changed the meaning of the revelation’s original 1829 intent. Included in the March 1829 instructions to Smith and Martin Harris is an apocalyptic passage.12 The 1835 D&C, however, presented a largely reworked version of this. This later version is much shorter than the earlier one. In comparing the 1835 D&C with the early manuscript copy, a number of features have been deleted from the earlier version, namely: (1) Satan “hath got great hold upon the hearts of the People of this Generation”; (2) the current generation of 1829 are not “far from the iniquities of Sodom and Gomorrah”; and (3) “Behold the Sword of justice doth hang above their heads & if they persist in the hardness of the[i]r hearts the time cometh that it must fall upon them.” These items are also found in the BC. It is clear that the 1835 D&C also adds to what is found in the manuscript. In [p.31] particular, the “desolating scourge” would occur periodically until the inhabitants are destroyed “by the brightness of my coming.” It is not clear how the editorial decision was made that resulted in the 1835 version, nor how it would have affected Martin Harris. But it is clear in this case that the uniformity of the manuscript and the BC against the later 1835 version argues that the earliest was closer to the original. Even though the later text is shorter, it shows evidence of being a revision. A Revelation to Oliver [Cowdery], given in Harmony, Pennsylvania, April, 1829, when employed a scribe for Joseph [Smith, Jr.], while translating the book of Mormon. A great and marvelous work is about to come forth unto the children of men: behold I am God, and give heed unto my word, which is quick and powerful, sharper than a two-edged sword, to the dividing asunder of both joints and marrow:— Therefore give heed unto my words. Behold the field is white already to harvest, therefore whoso desireth to reap, let him thrust in his sickle with his might and reap while the day lasts, that he may treasure up for his soul everlasting salvation in the kingdom of God: Yea, whosoever will thrust in his sickle and reap, the same is called of God; therefore, if you will ask of me you shall receive; if you will knock it shall be opened unto you. Now as you have asked, behold I say unto you, keep my commandments, and seek to bring forth and establish the cause of Zion: seek not for riches but for wisdom, and behold the mysteries of God shall be unfolded unto you, and then shall you be made rich. Behold he that hath eternal life is rich. Verily, verily I say unto you, even as you desire of me, so shall it be unto you; and, if you desire, you shall be the means of doing much good in this generation. Say nothing but repentance unto this generation; keep my commandments and assist to bring forth my work according to my commandments, and you shall be blessed. Behold thou hast a gift, and blessed art thou because of thy gift. Remember it is sacred and cometh from above; and if thou wilt inquire, thou shalt know mysteries which are great and marvelous: therefore thou shalt exercise thy gift, that thou mayest find out mysteries, that thou mayest bring many to the knowledge of the [p.32] truth; yea, convince them of the error of their ways. Make not thy gift known unto any, save it be those which are of thy faith.—Trifle not with sacred things. If thou wilt do good, yea and hold out faithful to the end, thou shalt be saved in the kingdom of God, which is the greatest of all the gifts of God; for there is no gift greater than the gift of salvation. Verily, verily I say unto thee, blessed art thou for what thou hast done, for thou hast inquired of me, and behold as often as thou hast inquired, thou hast received instruction of my Spirit. If it had not been so, thou wouldst not have come to the place where thou art at this time. Therefore be diligent, stand by my servant Joseph [Smith, Jr.] faithfully in whatsoever difficult circumstances he may be, for the word’s sake. Admonish him in his faults and also receive admonition of him. Be patient; be sober; be temperate; have patience, faith, hope and charity. Behold thou art Oliver [Cowdery], and I have spoken unto thee because of thy desires, therefore, treasure up these words in thy heart. Be faithful and diligent in keeping the commandments of God, and I will incircle [encircle] thee in the arms of my love. Behold I am Jesus Christ, the Son of God. I am the same that came unto my own and my own received me not. I am the light which shineth in darkness, and the darkness comprehendeth it not. Verily, verily I say unto you, if you desire a further witness, cast your mind upon the night that you cried unto me in your heart, that you might know concerning the truth of these things; did I not speak peace to your mind concer[n]ing the matter?— What greater witness can you have than from God? And now behold, you have received a witness, for if I have told you things which no man knoweth, have you not received a witness? And behold I grant unto you a gift if you desire of me, to translate even as my servant Joseph [Smith, Jr.]. Verily, verily I say unto you, that there are records which contain much of my gospel, which have been kept back because of the wickedness of the people; and now I command you, that if you have good desires, a desire to lay up treasures for yourself in heaven, then shall you assist in bringing to light, with your gift, those parts of my scriptures which have been hidden because of iniquity. And now behold I give unto you, and also unto my servant Joseph [Smith, Jr.], the keys of this gift, which shall bring to light this ministry; and in the mouth of two or three witnesses, shall every word be established. Verily, verily I say unto you, if they reject my words, and this part of my gospel and ministry, blessed are ye, for they can do no more unto you than unto me; and if they do unto you, even as they have done unto me, blessed are ye, for you shall [p.33] dwell with me in glory: but if they reject not my words, which shall be established by the testimony which shall be given, blessed are they; and then shall ye have joy in the fruit of your labors. Therefore fear not little flock, do good, let earth and hell combine against you, for if ye are built upon my Rock, they cannot prevail. Behold I do not condemn you, go your ways and sin no more: perform with soberness the work which I have commanded you: look unto me in every thought, doubt not, fear not: behold the wounds which pierced my side, and also the prints of the nails in my hands and feet: be faithful; keep my commandments, and ye shall inherit the kingdom of heaven: Amen. [p.34] And the Lord said unto me, John, my beloved, what desirest thou? For if ye shall ask, what you will, it shall be granted unto you. And I said unto him, Lord, give unto me power over death, that I may live and bring souls unto thee. And the Lord said unto me, Verily, verily, I say unto thee, because thou desirest this thou shalt tarry until I come in my glory, and shall prophesy before nations, kindreds, tongues and people. I say unto thee, Peter, this was a good desire, but my beloved has desired that he might do more, or a greater work, yet among men than what he has before done; yea, he has undertaken a greater work; therefore, I will make him as flaming fire and a ministering angel: he shall minister for those who shall be heirs of salvation who dwell on the earth; and I will make thee to minister for him and for thy brother James: and unto you three I will give this power and the keys of this ministry until I come. In April 1829 a revelation was received which was called “A revelation concerning John the beloved deciple [disciple].” There are two early manuscripts which agree in wording.15 When this revelation was published in the BC, the following background information was given: “A Revelation given to Joseph and Oliver, in Harmony, Pennsylvania, April, 1829, when they desired to know whether John, the beloved disciple, tarried on earth. Translated from parchment, written and hid up by himself.”16 This idea of a translation from parchment fits the time frame when they were working on the Book of Mormon. The 1839 Manuscript History explains that Cowdery and Smith wanted to know if John the Apostle “died, or whether he continued” on the earth.17 When this revelation was prepared for republication, to the question, “John my beloved, what desirest thou,” the following words were added: “For if ye shall ask, what you will, it shall be granted unto you.” This promise is more than what was originally offered. In the original version the Lord simply asked John what he wanted. Being granted whatever he asked is outside the scope of the original revelation. In the manuscript version John requests “power that I may bring souls unto thee.” This was expanded in just two words, to power “over death,” which is beyond his original request. therefore, I will make him as flaming fire and a ministering angel: he shall minister for those who shall be heirs of salvation who dwell on the earth; and I will make thee to minister for him and for thy brother James: and unto you three I will give this power and the keys of this ministry until I come. The manuscript ending has “&c &c &c.” This is at the end of the text of the document. The added words are previous and not after BC 6:3. Since the earlier text is the shorter of the two and BC follows the manuscript version, in terms of text criticism this appears to support the early text. One of the manuscripts (Woodford’s #1) needs to be made available for further study.18 While there is space at the bottom of BC page 18 for additional material, this would be after the last words and, like page 21 or 30, would not mean that there was more text to be added. At a meeting held on 17 February 1834, Joseph Smith established the Kirtland High Council. He taught: “The apostle, Peter, was the president of the Council and held the keys of the Kingdom of God on the earth[,] was appointed to this office by the voice of the Savior and acknowledged in it by the voice of the Church. He had two men appointed as Counsellors with him, and in case Peter was absent, his counsellors could transact business, or either one of them.”20 In 1834 the presidency was given additional responsibilities in presiding over the twelve members of the high council. They became known as the First Presidency of the church. The change regarding Peter being one of the “three” with John and James would seem to be a later addition arising from a time when the church had three presiding officers, appealing to Peter’s alleged position as head of the high council in the New Testament church. A Revelation given to Oliver, in Harmony, Pennsylvania, April, 1829. Oliver [Cowdery], verily, verily I say unto you, that assuredly as the Lord liveth, which is your God and your Redeemer, even so sure shall you receive a [p.36] knowledge of whatsoever things you shall ask in faith, with an honest heart, believing that you shall receive a knowledge concerning the engravings of old records, which are ancient, which contain those parts of my scripture of which have been spoken, by the manifestation of my Spirit; yea, behold I will tell you in your mind and in your heart by the Holy Ghost, which shall come upon you and which shall dwell in your heart. Now, behold this is the Spirit of revelation:— behold this is the spirit by which Moses brought the children of Israel through the Red sea on dry ground: therefore, this is thy gift; apply unto it and blessed art thou, for it shall deliver you out of the hands of your enemies, when, if it were not so, they would slay you and bring your soul to destruction. O remember, these words and keep my commandments. Remember this is your gift. Now this is not all, for you have another gift, which is the gift of working with the rod: behold it has told you things: behold there is no other power save God, that can cause this rod of nature, to work in your hands,21 for it is the work of God; and therefore whatsoever you shall ask me to tell you by that means, that will I grant unto you, that you shall know. Remember that without faith you can do nothing. Trifle not with these things. Do not ask for that which you ought not. Ask that you may know the mysteries of God, and that you may translate all those ancient records, which have been hid up, which are sacred, and according to your faith shall it be done unto you. Behold it is I that have spoken it, and I am the same which spake unto you from the beginning:— Amen. Now this is not all thy gift; for you have another gift, which is the gift of Aaron: Behold it has told you many things: behold, there is no other power save the power of God that can cause this gift of Aaron to be with you; therefore, doubt not, for it is the gift of God, and you shall hold it in your hands, and do marvelous works; and no power shall be able to take it away out of your hands; for it is the work of God. And therefore, whatsoever you shall ask me to tell you by that means, that will I grant unto you and you shall have knowledge concerning it: remember, that without faith you can do nothing. Therefore, ask in faith. Trifle not with these things: do not ask for that which you ought not: ask that you may know the mysteries of God, and that you may translate and receive knowledge from all those ancient records which have been hid up, that are sacred, and according to your faith shall it be done unto you. This addition, which is not in the BC, still identifies Cowdery’s gift as being in his hands. The deletion of the words “working with the rod” and the “rod” of “nature” makes the meaning less clear as to how he might work his gift in obtaining revelations. It seems that Cowdery obtained revelations as he worked with a divining rod, but, with the change, the allusion to Aaron’s rod which budded (Num. 17:8), is obscurantist. Behold I say unto you, my son, that, because you did not translate according to that which you desired of me, and did commence again to write for my servant Joseph [Smith, Jr.], even so I would that you should continue until you have finished this record, which I have intrusted unto you: and then behold, other records have I, that I will give unto you power that you may assist to translate. Be patient my son, for it is wisdom in me, and it is not expedient that you should translate at this present time. Behold the work which you are called to do, is to write for my servant Joseph [Smith, Jr.]; and behold it is because that you did not continue as you commenced, when you begun to translate, that I have taken away this privilege from you. Do not murmur my son, for it is wisdom in me that I have dealt with you after this manner. Behold you have not understood, you have supposed that I would give it unto you, when you took no thought, save it was to ask me; but behold I say unto you, that you must study it out in your mind; then you must ask me if it be right, and if it is right, I will cause that your bosom shall burn within you: therefore, you shall feel that it is right; but if it be not right, you shall have no such feelings, but you shall have a stupor of thought, that shall cause you to forget the thing which is wrong: therefore, you cannot write that which is sacred, save it be given you from me. Now if you had known this, you could have translated: nevertheless, it is not expedient that you should translate now. Behold it was expedient when you commenced, but you feared and the time is past, that it is not expedient now: for, do you not behold that I have given unto my servant Joseph [Smith, Jr.] sufficient strength, whereby it is made up? and neither of you have I condemned. Do this thing which I have commanded you, and you shall prosper. Be faithful, and yield to no temptation. Stand fast in the work wherewith I have called you, and a hair of your head shall not be lost, and you shall be lifted up at the last day: Amen. [p.38] A Revelation given to Joseph, in Harmony, Pennsylvania, May, 1829, informing him of the alteration of the Manuscript of the fore part of the book of Mormon. Now, behold I say unto you, that because you delivered up so many writings, which you had power to translate, into the hands of a wicked man,23 you have lost them, and you also lost your gift at the same time, nevertheless it has been restored unto you again: therefore, see that you are faithful and go on unto the finishing of the remainder of the work as you have begun. Do not run faster than you have strength and means provided to translate, but be diligent unto the end, that you may come off conquerer [conqueror]; yea, that you may conquer satan, and those that do uphold his work. Behold they have sought to destroy you; yea, even the man in whom you have trusted, and for this cause I said, that he is a wicked man, for he has sought to take away the things wherewith you have been intrusted; and he has also sought to destroy your gift, and because you have delivered the writings into his hands, behold they have taken them from you: therefore, you have delivered them up; yea, that which was sacred unto wickedness. And behold, satan has put it into their hearts to alter the words which you have caused to be written, or which you have translated, which have gone out of your hands; and behold I say unto you, that because they have altered the words, they read contrary from that which you translated and caused to be written; and on this wise the devil has sought to lay a cunning plan, that he may destroy this work; for he has put it into their hearts to do this, that by lying they may say they have caught you in the words which you have pretended to translate. Verily I say unto you, that I will not suffer that satan shall accomplish his evil design in this thing, for behold he has put it into their hearts to tempt the Lord their God; for behold they say in their hearts, We will see if God has given him power to translate, if so, he will also give him power again; and if God giveth him power again, or if he translate again, or in other words, if he bringeth forth the same words, behold we have the same with us, and we have altered them: Therefore, they will not agree, and we will say that he has lied in his words, and that he has no gift, and that he has no power: therefore, we will destroy him, and also the work, [p.39] and we will do this that we may not be ashamed in the end, and that we may get glory of the world. Verily, verily I say unto you, that satan has great hold upon their hearts; he stirreth them up to do iniquity against that which is good, that he may lead their souls to destruction, and thus he has laid a cunning plan to destroy the work of God; yea, he stirreth up their hearts to anger against this work; yea, he saith unto them, Deceive and lie in wait to catch, that ye may destroy: behold this is no harm, and thus he flattereth them and telleth them that it is no sin to lie, that they may catch a man in a lie, that they may destroy him, and thus he flattereth them, and leadeth them along until he draggeth their souls down to hell; and thus he causeth them to catch themselves in their own snare; and thus he goeth up and down, to and fro in the earth, seeking to destroy the souls of men. Verily, verily I say unto you, wo be unto him that lieth to decieve [deceive], because he supposeth that another lieth to decieve [deceive], for such are not exempt from the justice of God. Now, behold they have altered those words, because satan saith unto them, He hath decieved [deceived] you, and thus he flattereth them away to do iniquity, to tempt the Lord their God. Behold I say unto you, that you shall not translate again those words which have gone forth out of your hands; for behold, they shall not lie any more against those words; for behold, if you should bring forth the same words, they would say that you have lied; that you have pretended to translate, but that you have contradicted your words; and behold they would publish this, and satan would harden the hearts of the people, to stir them up to anger against you, that they might not believe my words: thus satan would overpower this generation, that the work might not come forth in this generation: but behold here is wisdom, and because I show unto you wisdom, and give you commandments concerning these things, what you shall do, show it not unto the world until you have accomplished the work. Marvel not that I said unto you, here is wisdom, show it not unto the world, for I said, show it not unto the world, that you may be preserved. Behold I do not say that you shall not show it unto the righteous; but as you cannot always judge the righteous, or as you cannot always tell the wicked from the righteous: therefore, I say unto you, hold your peace until I shall see fit to make all things known unto the world concerning the matter. And now, verily I say unto you, that an account of those things that you have written, which have gone out of your hands, are engraven upon the plates of Nephi; yea, and you remember, it was said in those writings, that a more particular account was given of these things upon the plates of Nephi. And now, because the account which is engraven upon the plates of Nephi, is more particular concerning the things, which in my wisdom I would bring to the knowledge of the people in this account: therefore, you shall translate the engravings which are on the plates of Nephi, down even till you come to the reign of king Benjamin, or until you come to that which you have translated, which you have retained; and behold, you shall publish it as the record of Nephi, and thus I will [p.40] confound those who have altered my words. I will not suffer that they shall destroy my work; yea, I will show unto them that my wisdom is greater than the cunning of the devil. Behold they have only got a part, or an abridgment of the account of Nephi. Behold there are many things engraven on the plates of Nephi, which do throw greater views upon my gospel: therefore, it is wisdom in me, that you should translate this first part of the engravings of Nephi, and send forth in this work. And behold, all the remainder of this work, does contain all those parts of my gospel which my holy prophets; yea, and also my disciples desired in their prayers, should come forth unto this people. And I said unto them, that it should be granted unto them according to their faith in their prayers; yea, and this was their faith, that my gospel which I gave unto them, that they might preach in their days, might come unto their brethren, the Lamanites,24 and also, all that had become Lamanites, because of their dissensions. Now this is not all, their faith in their prayers were, that this gospel should be made known also, if it were possible that other nations should possess this land; and thus they did leave a blessing upon this land in their prayers, that whosoever should believe in this gospel, in this land, might have eternal life; yea, that it might be free unto all of whatsoever nation, kindred, tongue, or people, that may be. And now, behold, according to their faith in their prayers, will I bring this part of my gospel to the knowledge of my people. Behold, I do not bring it to destroy that which they have received,25 but to build it up. And for this cause have I said, if this generation harden not their hearts, I will establish my church among them.26 Now I do not say this to destroy my church, but I say this to build up my church: therefore, whosoever belongeth to my church need not fear, for such shall inherit the kingdom of heaven: but it is they who do not fear me, neither keep my commandments, but buildeth up churches unto themselves, to get gain; yea, and all those that do wickedly, and buildeth up the kingdom of the devil; yea, verily, verily I say unto you, that it is they that I will disturb, and cause to tremble and shake to the centre [center]. Behold, I am Jesus Christ, the Son of God: I came unto my own, and my own received me not. I am the light which shineth in darkness, and the darkness comprehendeth it not. I am he who said other sheep have I which are not of this fold, unto my disciples, and many there were that understood me not. And I will show unto this people, that I had other sheep, and that they were a branch of the house of Jacob; and I will bring to light their marvelous works, which they did in my name; yea, and I will also bring to light my gospel, which was ministered unto them, and behold they shall not deny that which you have received, but they shall build it up, and shall bring to light the true points of my doctrine: Yea, and the only doctrine which is in me; and this I do, that I may establish my gospel, that there may not be so much contention: Yea, satan doth stir up the [p.41] hearts of the people to contention, concerning the points of my doctrine; and in these things they do err, for they do wrest the scriptures, and do not understand them: therefore, I will unfold unto them this great mystery, for behold, I will gather them as a hen gathereth her chickens under her wings, if they will not harden their hearts: Yea, if they will come, they may, and partake of the waters of life freely. Behold this is my doctrine: whosoever repenteth, and cometh unto me, the same is my church: whosoever declareth more or less than this, the same is not of me, but is against me: therefore, he is not of my church. And now, behold whosoever is of my church, and endureth of my church to the end, him will I establish upon my Rock, and the gates of hell shall not prevail against them. And now, remember the words of him who is the life and the light of the world, your Redeemer, your Lord and your God: Amen. Now, behold I say unto you, that because you delivered up those writings which you had power given unto you to translate, by the means of the Urim and Thummim, into the hands of a wicked man, you have lost them; and you also lost your gift at the same time, and your mind became darkened; nevertheless, it is now restored unto you again, therefore see that you are faithful and continue on unto the finishing of the remainder of the work of translation as you have begun: do not run faster, or labor more than you have strength and means provided to enable you to translate; but be diligent unto the end: pray always, that you may come off conquerer; yea, that you may conquer satan and that you may escape the hands of the servants of satan, that do uphold his work. [p.42] A Revelation given to Hyrum, in Harmony, Pennsylvania, May, 1829. A great and marvelous work is about to come forth among the children of men: behold I am God and give heed to my word, which is quick and powerful, sharper than a two-edged sword, to the dividing asunder of both joints and marrow: therefore, give heed unto my word. Behold the field is white already to harvest, therefore, whoso desireth to reap, let him thrust in his sickle with his might, and reap while the day lasts, that he may treasure up for his soul everlasting salvation in the kingdom of God; yea, whosoever will thrust in his sickle and reap, the same is called of God: therefore, if you will ask of me, you shall receive; if you will knock, it shall be opened unto you. Now as you have asked, behold I say unto you, keep my commandments, and seek to bring forth and establish the cause of Zion. Seek not for riches but for wisdom, and behold the mysteries of God shall be unfolded unto you, and then shall you be made rich; behold he that hath eternal life is rich. Verily, verily I say unto you, even as you desire of me, so shall it be done unto you; and, if you desire you shall be the means of doing much good in this generation. Say nothing but repentance unto this generation. Keep my commandments, and assist to bring forth my work according to my commandments, and you shall be blessed. Behold thou has a gift, or thou shalt have a gift, if thou wilt desire of me in faith, with an honest heart, believing in the power of Jesus Christ, or in my power which speaketh unto thee: for behold it is I that speaketh: behold I am the light which shineth in darkness, and by my power I give these words unto thee. And now, verily, verily I say unto thee, put your trust in that Spirit which leadeth to do good: Yea, to do justly; to walk humbly; to judge righteously; and this is my Spirit. Verily, verily I say unto you, I will impart unto you of my Spirit, which shall enlighten your mind, which shall fill your soul with joy, and then shall you know, or by this shall you know, all things whatsoever you desire of me, which is pertaining unto things of righteousness, in faith believing in me that you shall receive. Behold I command you, that you need not suppose that you are called to preach until you are called: wait a little longer, until you shall have my word, my Rock, my church, and my gospel, that you may know of a surety my doctrine; and then behold, according to your desires, yea, even according to your faith, shall it be done unto you. Keep my commandments; hold your peace; appeal unto my Spirit: Yea, cleave [p.43] unto me with all your heart, that you may assist in bringing to light those things of which have been spoken: Yea, the translation of my work: be patient until you shall accomplish it. Behold this is your work, to keep my commandments: Yea, with all your might, mind, and strength: seek not to declare my word, but first seek to obtain my word, and then shall your tongues be loosed; then, if you desire you shall have my Spirit, and my word: Yea, the power of God unto the convincing of men: but now hold your peace; study my word which hath gone forth among the children of men; and also study my word which shall come forth among the children of men; or that which you are translating: Yea, until you have obtained all which I shall grant unto the children of men in this generation; and then shall all things be added thereunto. Behold thou art Hyrum, my son; seek the kingdom of God and all things shall be added according to that which is just. Build upon my Rock, which is my gospel; deny not the Spirit of revelation, nor the Spirit of prophecy, for wo unto him that denieth these things: therefore, treasure up in your hearts until the time which is in my wisdom, that you shall go forth: Behold I speak unto all who have good desires, and have thrust in their sickles to reap. Behold I am Jesus Christ, the Son of God: I am the life and the light of the world: I am the same which came unto my own, and my own received me not: but verily, verily I say unto you, that as many as receiveth me, them will I give power to become the sons of God, even to them that believe on my name: Amen. A Revelation given to Joseph (K.,) in Harmony, Pennsylvania, May, 1829, informing him how he must do, to be worthy to assist in the work of the Lord. A great and marvelous work is about to come forth among the children of men: behold I am God, and give heed to my word, which is quick and powerful, sharper than a two-edged sword, to the dividing asunder of both joints and marrow: therefore, give heed unto my word. Behold the field is white already to harvest, therefore whoso desireth to reap, let him thrust in his sickle with his might, and reap while the day lasts, that he may treasure up for his soul everlasting salvation in the kingdom of God: Yea, whosoever will thrust in his sickle and reap, the same is called of God: therefore, if you will ask of me you shall receive; if you will knock it shall be opened unto you. [p.44] Now as you have asked, behold I say unto you, keep my commandments, and seek to bring forth and establish the cause of Zion. Behold I speak unto you, and also to all those who have desires to bring forth and establish this work, and no one can assist in this work, except he shall be humble and full of love, having faith, hope and charity, being temperate in all things, whatsoever shall be intrusted to his care. Behold I am the light and the life of the world, that speaketh these words: therefore, give heed with your might, and then you are called: Amen. A Revelation given to David, in Fayette, New-York, June, 1829. A great and marvelous work is about to come forth unto the children of men: behold I am God, and give heed to my word, which is quick and powerful, sharper than a two-edged sword, to the dividing asunder of both joints and marrow: therefore, give heed unto my word. Behold the field is white already to harvest, therefore, whoso desireth to reap, let him thrust in his sickle with his might, and reap while the day lasts, that he may treasure up for his soul everlasting salvation in the kingdom of God: Yea, whosoever will thrust in his sickle and reap, the same is called of God: therefore, if you will ask of me you shall receive; if you will knock it shall be opened unto you. Seek to bring forth and establish my Zion.— Keep my commandments in all things, and if you keep my commandments, and endure to the end, you shall have eternal life; which gift is the greatest of all the gifts of God. And it shall come to pass, that if you shall ask the Father in my name, in faith believing, you shall receive the Holy Ghost, which giveth utterance, that you may stand as a witness of the things of which you shall both hear and see; and also, that you may declare repentance unto this generation. Behold I am Jesus Christ the Son of the living God, which created the heavens and the earth; a light which cannot be hid in darkness: wherefore, I must bring forth the fulness of my gospel from the Gentiles unto the house of Israel. And behold thou art David, and thou art called to assist: Which thing if ye do, and are faithful, ye shall be blessed both spiritually and temporally, and great shall be your reward: Amen. [p.45] A Revelation given to John, in Fayette, New-York, June, 1829. Hearken my servant John [Whitmer], and listen to the words of Jesus Christ, your Lord and your Redeemer, for behold I speak unto you with sharpness and with power, for mine arm is over all the earth, and I will tell you that which no man knoweth save me and thee alone: for many times you have desired of me to know that which would be of the most worth unto you. And now behold I say unto you, that the thing which will be of the most worth unto you, will be to declare repentance unto this people, that you may bring souls unto me, that you may rest with them in the kingdom of my Father. Amen. A Revelation given to Peter, in Fayette, New-York, June, 1829. Hearken my servant Peter [Whitmer, Jr.], and listen to the words of Jesus Christ, your Lord and your Redeemer, for behold I speak unto you with sharpness and with power, for mine arm is over all the earth, and I will tell you that which no man knoweth save me and thee alone: for many times you have desired of me to know that which would be of the most worth unto you. [p.46] A Revelation to Joseph, Oliver and David, making known the calling of twelve disciples in these last days, and also, instructions relative to building up the church of Christ, according to the fulness of the gospel: Given in Fayette, New-York, June, 1829. Wherefore you know that they are true; and if you know that they are true, behold I give unto you a commandment, that you rely upon the things which are written; for in them are all things written, concerning my church, my gospel, and my rock. Wherefore if you shall build up my church, and my gospel, and my rock, the gates of hell shall not prevail against you. Wherefore he hath fulfilled the thing which I commanded him. Wherefore if he shall be diligent in keeping my commandments, he shall be blessed unto eternal life, and his name is Joseph [Smith, Jr.]. For behold I command all men every where to repent, and I speak unto you, even as unto Paul mine apostle, for you are called even with that same calling with which he was called. For behold the Lord your God suffered death in the flesh: wherefore he suffered the pain of all men, that all men might repent and come unto him. [p.47] And how great is his joy in the soul that repenteth. Wherefore you are called to cry repentance unto this people. And if it so be that you should labor in all your days, in crying repentance unto this people, and bring save it be one soul only unto me, how great shall be your joy with him in the kingdom of my Father? And now if your joy will be great with one soul, that you have brought unto me into the kingdom of my Father, how great will by your joy, if you should bring many souls unto me? Ask the Father in my name in faith believing that you shall receive, and you shall have the Holy Ghost which manifesteth all things, which is expedient unto the children of men. And if you have not faith, hope and charity, you can do nothing. Contend against no church, save it be the church of the devil. Take upon you the name of Christ, and speak the truth in soberness, and as many as repent, and are baptized in my name, which is Jesus Christ, and endure to the end, the same shall be saved. Wherefore if they know not the name by which they are called, they cannot have place in the kingdom of my Father. Wherefore you must perform it according to the words which are written. Behold my grace is sufficient for you: You must walk uprightly before me and sin not. And I Jesus Christ, your Lord and your God, have spoken it. Wherefore you can testify that you have heard my voice, and know my words. And when you have found them you shall show these things unto them. For all men must repent and be baptized; and not only men, but women and children, which have arriven [arrived] to the years of accountability. Wherefore the blessings which I give unto you are above all things. And after that you have received this, if you keep not my commandments, you cannot be saved in the kingdom of my Father. Behold I Jesus Christ, your Lord and your God, and your Redeemer, by the power of my Spirit, have spoken it: Amen. behold I give unto you a commandment, that you rely upon the things which are written; for in them are all things written concerning the foundation of my church, my gospel and my rock; wherefore, if you shall build up my church upon the foundation of my gospel and my rock, the gates of hell shall not prevail against you. for behold the Lord your Redeemer suffered death in the flesh: wherefore he suffered the pain of all men, that all men might repent and come unto him. Behold I say unto you, that you must rely upon my word, which if you do, with full purpose of heart, you shall have a view of the plates, and also the breastplate, the sword of Laban, the Urim and Thummim,35 which were given to the brother of Jared upon the mount, when he talked with the Lord face to face, and the miraculous directors which were given to Lehi while in the wilderness, on the borders of the red sea; and it is by your faith that you shall obtain a view of them, even by that faith which was had by the prophets of old. And after that you have obtained faith, and have seen them with your eyes, you shall testify of them, by the power of God; and this you shall do that my servant Joseph Smith, jr. may not be destroyed, that I may bring about my righteous purposes unto the children of men, in this work. And ye shall testify that you have seen them, even as my servant Joseph Smith, jr. has seen them, for it is by my power that he has seen them, and it is because he had faith: and he has translated the book, even that part which I have commanded him, and as your Lord and your God liveth it is true. Wherefore you have received the same power, and the same faith, and the same gift like unto him; and if you do these last commandments of mine, which I have given you, the gates of hell shall not prevail against you; for my grace is sufficient for you: and you shall be lifted up at the last day.— And I, Jesus Christ, your Lord and your God, have spoken it unto you, that I might bring about my righteous purposes unto the children of men. Amen. In two 1829 revelations, as published in the 1835 D&C, mention is made of the “Urim and Thummim.” BC 9, dated May 1829, states that Smith delivered to Martin Harris writings “which you had power to translate.” This was expanded to include (in italic) that Smith had power “to translate, by the means of the Urim and Thummim.” This addition, using the names of biblical instruments of divination, appears to be an anachronism for an 1829 revelation. Of interest is that the second revelation, though in manuscript form, was not published in the BC. When it was copied into the Kirtland Revelations Book in [p.50] 1834-35, the text had already been changed to reflect the current understanding. The three witnesses to the Book of Mormon were to see certain artifacts, such as “a view of the plates, and also the breastplate, the sword of Laban, the Urim and Thum[m]im.”36 The Kirtland Revelations Book manuscript copy thus reflects a later tradition not known in June 1829. The printed testimony of the three witnesses only mentioned the plates. It is of interest that while the term “Urim and Thummim” is contained in the Bible, it is not found in the Book of Mormon. [p.51] That “Urim and Thummim” was an addition to the text is evident since it was a development in early church history and culminated in its inclusion in the 1835 D&C.42 Primary sources tell us that a seer stone was used in the translation process. But the wording here does not clear up questions about what objects were used in producing the Book of Mormon. Retaining all power, even to the destroying of satan and his works at the end of the world, and the last great day of judgment, which I shall pass upon the inhabitants thereof, judging every man according to his works, and the deeds which he hath done. Yea, to those who are found on my left hand, nevertheless, it is not written, that there shall be no end to this torment; but it is written endless torment. Wherefore, I will explain unto you, this mystery, for it is mete unto you, to know even as mine apostles. I speak unto you that are chosen in this thing, even as one, that you may enter into my rest. How sore you know not! How exquisite you know not! Yea, how hard to bear you know not! Wherefore, I command you again by my Almighty power, that you confess your sins, lest you suffer these punishments of which I have spoken, of which in the smallest, yea, even in the least degree you have tasted at the time I withdrew my Spirit. Wherefore, learn of me, and listen to my words; walk in the meekness of my Spirit and you shall have peace in me, Jesus Christ by the will of the Father. And again: I command you, that thou shalt not covet thy neighbor’s wife. Nor seek thy neighbor’s life. And again: I command you, that thou shalt not covet thine own property, but impart it freely to the printing of the book of Mormon, which contains the truth and the word of God, which is my word to Gentile, that soon it may go to the Jew, of which the Lamanites are a remnant; that they may believe the gospel, and look not for a Messiah to come which has already come. Yea, before the world as well as in secret; in public as well as in private. And thou shalt declare glad tidings; yea, publish it upon the mountains, and upon every high place, and among every people which thou shalt be permitted to see. And thou shalt do it with all humility, trusting in me, reviling not against revilers. And of tenets thou shalt not talk, but thou shalt declare repentance and faith on the Savior and remission of sins by baptism and by fire; yea, even the Holy Ghost. For this shall suffice for thy daily walk even unto the end of thy life. And misery thou shalt receive, if thou wilt slight these counsels; Yea, even destruction of thyself and property. Impart a portion of thy property; Yea, even a part of thy lands and all save the support of thy family. Leave thy house and home, except when thou shalt desire to see them. And speak freely to all: Yea, preach, exhort, declare the truth, even with a loud voice; with a sound of rejoicing, crying hosanna! hosanna! blessed be the name of the Lord God. Yea, even more than if you should obtain treasures of earth, and corruptibleness to the extent thereof. Yea, come unto me thy Savior. Amen. wherefore, I command you to re pent, and keep the commandments which you have received by the hand of my servant Joseph Smith, jr. in my name: and it is by my almighty power that you have received them: therefore I command you to repent, repent, lest I smite you by the rod of my mouth, and by my wrath, and by my anger, and your sufferings be sore: how sore you know not! how exquisite you know not! yea, how hard to bear you know not! where fore, I command you again to repent lest I humble you by my almighty power, and that you confess your sins lest you suffer these punishments of which I have spoken, of which in the smallest, yea, even in the least degree you have tasted at the time I withdrew my Spirit. And I command you, that you preach nought but repentance; and show not these things unto the world until it is wisdom in me; for they cannot bear meat now, but milk they must receive: wherefore, they must not know these things lest they perish: learn of me, and listen to my words; walk in the meekness of my Spirit and you shall have peace in me: I am Jesus Christ: I came by the will of the Father, and I do his will. Pay the debt thou hast contracted with the printer. BC 16 is a commandment to Martin Harris previous to the church’s organization. A comparison shows that the emphasis “I [God] command you by my name” is subordinated to Smith’s authority as revelator. The additional wording in the text would not have been what Harris had heard in 1830. The change emphasizes Harris’s need to obey the commandments he received through Smith. Another textual addition qualifies the command to “show not these things, neither speak these things unto the world” with the words “until it is wisdom in me,” implying that Harris was to be silent on certain matters but that the 1835 committee was free of such a proscription. That this is a correct understanding may be seen in a later revelation dated 3 November 1831 wherein it states clearly: “And for this cause these commandments were given; they were commanded to be kept from the world in the d[a]y that they were given, but now are to go forth unto all flesh[. ]”44 This phrase “until it is wisdom in me” was probably added to the revelation for Martin Harris because it would now be published to the world. 1. This is Joseph Smith’s first recorded revelation. The revelation is believed to have been given through the seer stone that Joseph had in his possession. Smith was twenty- two years old at this time. 2. Martin Harris was the principle scribe for Joseph Smith from about 12 April to 14 June 1828. Harris was forty-five years old. 3. The names Nephites, Jacobites, Josephites, Zoramites, Lamanites, Lemuelites, and Ishmaelites are found in three places in the Book of Mormon. See 1830 BOM, 124, 517, 519; LDS and RLDS Jacob 1:13; LDS 4 Ne. 1:36-38/RLDS 1:40-42 and LDS and RLDS Morm. 1:8-9. 4. Martin Harris traveled from Palmyra, New York, to Harmony to see the plates. 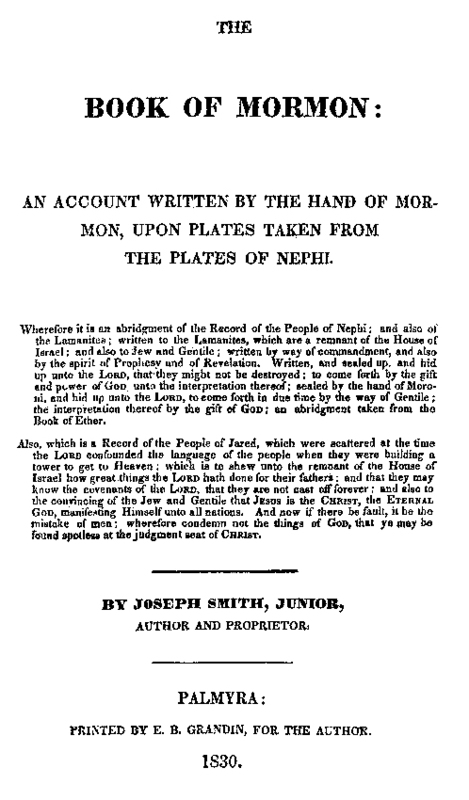 The heading of BC 4 indicates that “Martin desired of the Lord to know whether Joseph had, in his possession, the record of the Nephites.” Harris did not see the plates at this time but was promised he would be one of three witnesses to view the plates. On Harris wanting a greater witness, see affidavit of Isaac Hale, 20 Mar. 1834, in Susquehanna Register, and Northern Pennsylvanian 9 (1 May 1834): 1. 6. The revelation ends with the word “Amen” in the BC. 7. J[onathan]. B. Turner, Mormonism in All Ages: or the Rise, Progress, and Causes of Mormonism (New York: Published by Platt and Peters, 1842), 225-26, emphasis in original. 8. McLellin to Joseph Smith III, July 1872, original in RLDS archives; and David Whitmer, An Address to All Believers in Christ (Richmond, MO: author, 1887), 57-58. 9. Whitmer, An Address to All Believers in Christ, 57, emphasis in original. 10. 1830 BOM, 66; LDS 2 Ne. 3:8; RLDS 2:13. 11. OT MS #2, 64, RLDS archives. This work is variously known as the Inspired Version, the Joseph Smith Bible Revision, and the JST. Gen. 50:28 (JST). The JST is Joseph Smith’s doctrinal correction (“translation”) of the OT and NT and does not restore the Hebrew or Greek biblical text. 12. See BC 4:5-6. Cf. 1830 BOM, 487, 499-501; LDS 3 Ne. 16:10; 21:6, 19-22; RLDS 3 Ne. 7:34; 9:92, 105-106. 13. Oliver Cowdery arrived at Harmony on 5 April 1829 with Samuel Harrison Smith. Two days later on 7 April Cowdery commenced as Joseph Smith’s scribe. Cowdery was twenty-two years old. 14. The BC has in its heading: “they [Smith and Cowdery] desired to know whether John, the beloved disciple, tarried on earth. Translated from parchment, written and hid up by himself [John].” There is no evidence that the ancient manuscript was physically present for Smith to translate. A revelation was given to him concerning the essence of the hidden text. See John 21:20-24. 15. Robert J. Woodford, “The Historical Development of the Doctrine and Covenants,” Ph.D. diss., Brigham Young University, 1974, 182-83. 16. BC 6:1. The Evening and the Morning Star 1 (May 1833): [6; whole page no. 94], contains the last part of the text of this early document and was probably based upon the BC manuscript then in Independence, Missouri. 17. Dean C. Jessee, ed., The Papers of Joseph Smith: Autobiographical and Historical Writings (Salt Lake City: Deseret Book Co., 1989), 1:289. 18. Woodford, “Historical Development of the Doctrine and Covenants,” 177-83. 19. Document no. 94; LDS D&C 81:2; RLDS D&C 80:1. 20. Kirtland Council Minute Book, 30, LDS archives. 21. The “rod of nature” in Cowdery’s “hands” refers to his possession of a divining rod. 22. For various ideas on the dating of this document, see Max H. Parkin, “A Preliminary Analysis of the Dating of Section 10,” The Seventh Annual Sidney B. Sperry Symposium: The Doctrine and Covenants (Provo, UT: Brigham Young University, 1979), 68-84. 23. Martin Harris. See document no. 1, dated July 1828. The writing of the early portion of the BOM was not recovered by May 1829. 24. “Lamanites” is a BOM term for the Native American Indians. 26. 1830 BOM, 501; LDS 3 Ne. 21:22/RLDS 10:1. 27. The opening portion of this revelation contains the same words as document no. 4. 28. The first part of this revelation to Joseph Knight, Sr., contains the same wording as documents 4 and 9. 29. David Whitmer transported Joseph Smith and Oliver Cowdery from Harmony, Pennsylvania, to the residence of his father Peter Whitmer, Sr., in the township of Fayette, New York, about 1 June 1829. This revelation as well as the two which follow were given shortly after their arrival. The opening part of this revelation to David Whitmer contains the same words as documents 4, 9, and 10. 30. John Whitmer became a scribe to Smith for a portion of the BOM manuscript. Whitmer was twenty-seven years old. 31. The wording of this revelation is the same as that given to his brother John Whitmer (document no. 12). 32. This revelation was given by 14 June 1829 as a letter written by Oliver Cowdery to Hyrum Smith which contains similar wording. It was not until 6 April 1830 that the Church of Christ was or ganized at Manchester, New York. It was here that Oliver Cowdery or dained Joseph Smith an elder, prophet, and seer. 33. On 26 Oc to ber 1831, “The Clerk [Oliver Cowdery] said that the direc tions which himself & his br[other]. David Whitmer had received this morning respecting the choice of the twelve was that they would be ordained & sent forth from the Land of Zion [Missouri]” (Donald Q. Cannon and Lyndon W. Cook, eds., Far West Record: Minutes of The Church of Jesus Christ of Latter- day Saints, 1830-1844 [Salt Lake City: Deseret Book Co., 1983], 26). Five and a half years later, on 14 February 1835, Cowdery and David Whitmer with the addition of Martin Harris (the three witnesses to the Book of Mormon) chose twelve men to be ordained as apostles in Kirtland, Ohio (Kirtland Council Minute Book, 149). 34. This revelation was written for the three witnesses but was not included in the BC. Ezra Booth mentioned that he examined it while he was in Missouri (Booth to Rev. Ira Eddy, 24 Oct. 1831, Ohio Star 2 [27 Oct. 1831]:3, Ravenna, Ohio). 35. The term “Urim and Thummim” as published in 1835 was not in use in 1829. 38. See J. D. Douglas, ed., The New Bible Dictionary (Grand Rapids, MI: Wm. B. Eerdmans Publishing Co., 1978), “Teraphim,” 1,253; “Urim and Thummim,” 1,306. Teraphim in the King James Version (KJV): Judg. 17:5; 18:14, 17-18, 20, and Hosea 3:4. “Urim” and “Thummim” in KJV in the following passages: Ex. 28:30; Lev. 8:8; Deut. 33:8; Ezra 2:63; Neh. 7:65. “Urim” in Num. 27:21; 1 Sam. 28:6. 40. Douglas, New Bible Dictionary, 1,306; Kenneth Sowers, “The Mystery and History of the Urim and Thummim,” Restoration Studies II (Independence, MO: Herald Publishing House, 1983), 75-79. See also “Urim and Thummim” in The Interpreter’s Dictionary of the Bible: An Illustrated Encyclopedia (New York: Abingdon Press, 1962), 4:739-40. 14, emphasis in original. Phelps wrote on 15 January 1831 that he heard that the Book of Mormon “was interpreted by Joseph Smith, through a pair of silver spectacles, found with the plates” (Phelps to E. D. Howe, 15 Jan. 1831, in E. D. Howe, Mormonism Unvailed [Painesville (OH): Printed and Published by the Author, 1834], 273). 42. See Charles A. Davies in Question Time (Independence, MO: Herald House, 1967), 2: 111-12; and Richard P. Howard, Restoration Scriptures: A Study of Their Textual Development (Independence, MO: Herald House, 1969), 207-209; (2nd ed., 1995), 152-53. The BOM mentions two stones being received by the brother of Jared. See 1830 BOM, 545; LDS Ether 3:23, 28/RLDS 1:88, 93. 43. The BOM was advertized as being available for purchase on 26 March 1830 in the Wayne Sentinel (Palmyra, NY). Shortly afterwards, Martin Harris was at the Smith home in Manchester and insisted on having a commandment. See Dean C. Jessee, ed., “Joseph Knight’s Recollection of Early Mormon History,” BYU Studies 17 (Autumn 1976): 37. The revelation would have been given between 26 and 31 March 1830. 44. Document no. 77; The Evening and the Morning Star 1 (May 1833): [2; whole page no. 90]; LDS D&C 133:60; RLDS D&C 108:11. The Joseph Smith Revelations – 11: Appendix A. The Joseph Smith Revelations – 12: Appendix B. The Joseph Smith Revelations – 13: Appendix C.
The Joseph Smith Revelations – 14: Appendix D.
The Joseph Smith Revelations – 15: Appendix E.
The Joseph Smith Revelations – 16: Appendix F.